Attend the next Los Angeles sporting event in style by getting a limousine for your group. Whether you are looking for limousine service to Staples Center, limousine service to Angel Stadium, limousine service to Dodger Stadium, or limousine service to Honda Center, Ross Limo will get you there in style. We offer stress-free point-to-point sporting event limo service that takes the hassle away from fighting traffic, finding parking, and skipping the long walks and the uncomfortable shuttle rides. Depending on your preferences, we offer luxury sedans that seat 2 – 3 people comfortably. For larger groups, we offer 6, 8 or 10 passenger stretch limos. 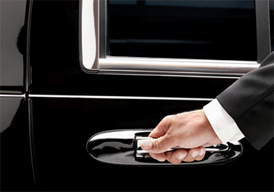 We also offer luxury limo SUVs for groups of 6 or less and luxury limo vans for groups of 10 or less. Our signature Sports package includes a pre-party in your choice of limousine, one bottle of alcohol and a door-to-door service to your event. After the event, your chauffeur can drop you off at Nokia Live sports bar for a couple of hours for a post party, and then take you and your party to your drop-off location. Our team is standing by 24 hours a day to respond to all of your sporting events limousine needs in Los Angeles.